To provide tools for enhancing the productivity for photographers. Transparency exporter: during export replaces a color by transparency. Keywords exporter: exports into multiple directories, optionally based on it’s keywords. Assessment: experience what Lightroom functions you use and (barely) not use. Productivy reports like Photo history, which reports how much time you spend on develop for example a wedding shoot. Best of all: all the reports are free! Our Lightroom plug-ins will enhance your workflow and productivity. Our Analytic reports like Develop statistics give insight in your develop productivity and costs in Lightroom. 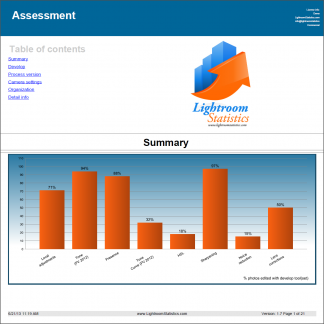 Our Assessment report delivers an in-depth analysis of your usage of Lightroom develop tools and organizing features. Investing in new equipment is costly! 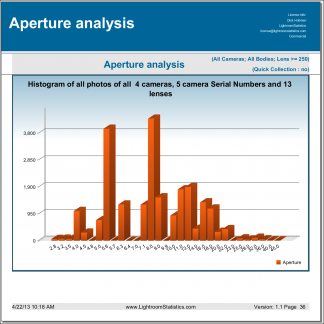 Be better prepared and analyze your current usage with the Lensage usage, Camera usage, Aperture, Focal length, ISO speed and Shutter speed professional analytical reports. Drill down from catalog wide to detailed info per camera, body and lens combination. Assessment: within a minute you get insight in how your students use Lightroom. Now you can personalize your courses to their needs and skills.